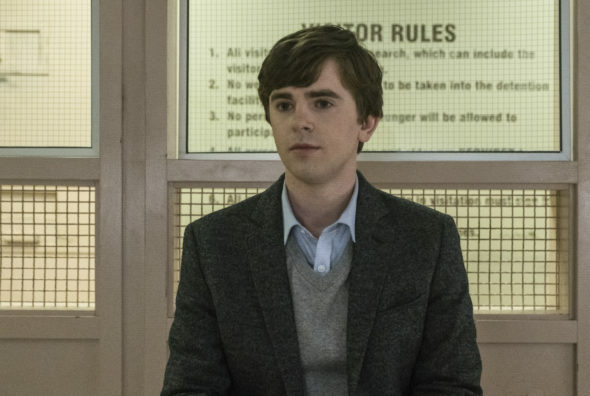 “This is how it ends, isn’t it?” So says Norman Bates (Freddie Highmore), in the new official trailer for the Bates Motel TV series finale. Check it out. “The Cord,” the last episode of the fifth and final season, airs on A&E on Monday, April 24, 2017 at 10:00pm ET/PT. Directly following it, A&E will air Bates Motel: The Check Out, a half-hour special, from 11:04pm to 11:34pm. A Psycho prequel series, Bates Motel stars Vera Farmiga, Highmore, Max Thieriot, Olivia Cooke, and Nestor Carbonell, with Kenny Johnson recurring. Rihanna guest starred in the last season on A&E as Marion Crane — a role originated by Janet Leigh in Alfred Hitchcock’s 1960 feature film. Here’s more on the special, via Deadline. Fans will get the chance to say goodbye to Norman and mama Norma with questions off social media answered by cast members Vera Farmiga (Norma), Freddie Highmore (Norman/Mother) and Nestor Carbonell (Sheriff Alex Romero) as well as EPs and creators, Kerry Ehrin and Carlton Cuse. In addition to interviews, favorite scenes and bloopers will be aired throughout. What do you think? Are you a fan of the Bates Motel TV show? Do you think it is ending at the right time, or should it have been renewed for season six? Bates Motel: Cancelled or Renewed for Season Six on A&E? I’m just devastated…. I’m saving the finale (which I recorded) to watch after I go back and binge-watch ALL the seasons again (and again) to savor the last “byte” as long as I can. I honestly will have a huge void with BATES MOTEL gone … and I do not think any other series will fill that void … kudos to all cast, crew, writers, directors involved. SUPERIOR JOB, and thanks for everything. (Hitch couldn’t have done a better job if he were alive). I’m so sad Bates is over. My husband and I looked forward to Monday nights so we could watch Bates together.I will truly miss the show and Thank everyone involved in making the show . I’m going to miss this one for sure. The acting by everyone was excellent! I hope to see the actors in other programs soon. I love Bates and am so sad it is ending. I wish the writers could come up with some additional seasons. All of the actors are great. I totally agree with you. I do not want Bates Motel to finish. I’m so sad! Please come up with couple more seasons! !